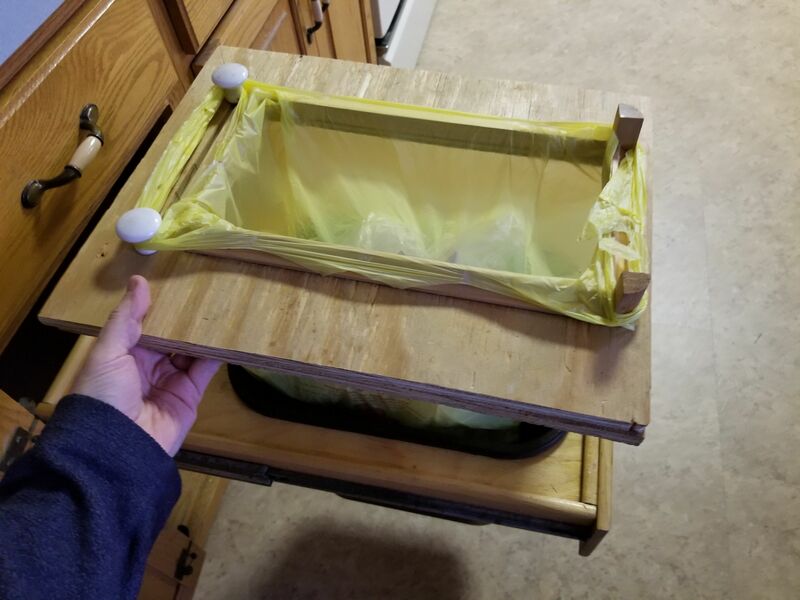 Just in time* for Xmas, I put together this custom garbage bag holder for my Mom. Following availability at local grocery stores she's switched to plastic bags, and been awkwardly using them on this built in garbage bin, where they're too small to fit properly. Here's a mostly plywood contraption to fit over the existing bin, but with pegs to hold the bags' handles plus some cove molding to help keep the bag open and in place. It's about the same depth but narrower than the bin beneath it to be the right size for standard plastic shopping bags. A cutout in the lower layer of plywood fits around the lip of the bin, while the top layer holds all the bits mentioned above. It's all made from found materials already around the house, which is the perfect kind of gift for my Mom. No new/extra stuff! * I definitely had an idea to do this over the Thanksgiving visit. And earlier in this visit. And forgot, despite a coded (to not give away the surprise) note to myself. Then I thought of it again, and realized what the note meant, and built this up over (mostly) a long afternoon on Xmas Eve.